This jacket can be used in any athletic or outdoor activity. Use it when you run or exercise, during the day or in the dark, when it is sunny or not so much. This jacket has it all. Available several colors in Child M - Adult L.
Moisture Wicking, light-weight,4-way stretch fabric. Provides sun protection up to UPF 50+. Ventilation flap on the back . Built-in reflection in the main zipper and the pockets. Reflective lines and ES logo on the back. Slim Fit with longer tail back. 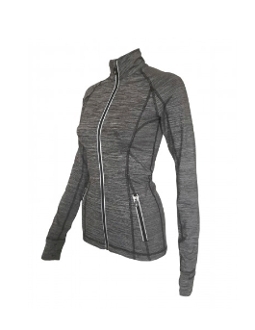 Great for running and workout in both warm and cold conditions.